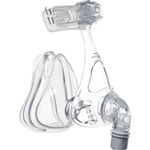 For those who prefer a full-face delivery for a mix of nasal and oral CPAP therapy, the FlexiFit™ 431 Full Face Mask offers a comfortable alternative to nasal or oral delivery. Features the highly popular Respironics blue gel plus advanced sure seal technology (SST) flap. ComfortGel Full is a first-class upgrade for patients who need a full-face mask.